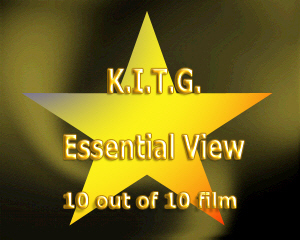 Some People say to me Why is the spelling of Ghoulies the way it is in the site title and not written Goolies.Well although a bit thin my reasons could be this review and others like it to follow as many martial art films from the East dealt with Ghosts and Ghouls in the Eighties and Nineties and the other reason i did not want the site solely associated with kicking people in the goolies and i felt i would get better exposure in search engines if i went with our Ghostly friend version. Any way that's my explanation. 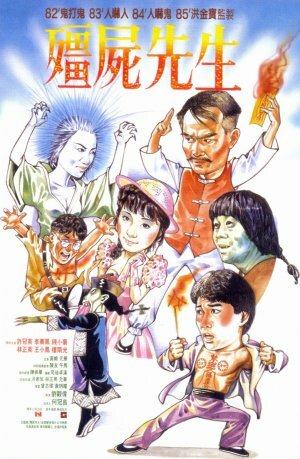 So on with the review of what is truly a landmark piece of film from Boho films and Golden Harvest and starring the late and great Lam Ching Ying 'who we cover in the Artists pages ' Moon Lee also stars with Ricky Hui ,Chin Siu-Ho in a film directed by Ricky Lau. 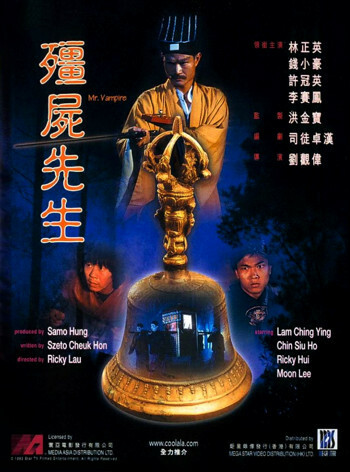 Here Lam Ching-Ying plays priest Kau who in a attempt to Rebury a rich mans fathers corpse which is buried in poor ground ( The Chinese believe that if bodies are buried in poor or evil ground where maybe bad things have happened that bad luck will befall the following generations) is amazed to find the body still intact and is taken back to his place of worship so he may prepare for reburial to stop the body from rising ,but these attempts fail and the body becomes a Jiang-shi ( hopping Vampire) . 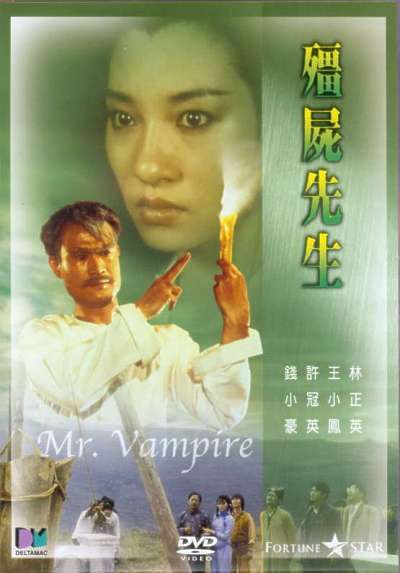 Now this Vampire hops around killing people and in the fight to stop it one of Kau's disciples Man Choi (here played by Ricky Hui) gets infected and is on vampire watch to stop him turning in to one himself,on top of this his other disciple Tsau Tsang (played by Chin Siu Ho) gets possessed by a ghost of a woman who wants to take his soul.So along with these problems Kau must fight to save the community from the Vampire ,but is accused himself by the police who is after having a relationship with the Vampire's sons Daughter here played by Moon Lee . What ensues is a action packed 90 minutes where Tsau is confronting his own feelings for a ghost, Man Choi falling for Yan (Moon Lee) & not obeying Priest Kau and is slowly turning Vampish.All in all this film is packed to the gills with Spot on effects some amazing real life stunts with dramatic falls , martial arts people on fire and more .Top this with some brilliant comedy you can see why this film was such a hit that spawned 4 sequels as well as many spin off movies.So here goes it's not that often you will see this on kick'em in the Ghoulies . Score out of Ten = 10 . Huang Ha as Master Yam (任老爺), a rich man. Apparently killed by the vampire, he rises from the dead as well to become like his late father. Anthony Chan as Priest Four Eyes (四目道長), Kau's friend. He uses magic to control "hopping" corpses and transport them to their hometowns for burial. Billy Lau as Wai (阿威), the cowardly police inspector. He is also Ting-ting's cousin.